Planet-C or VCO (Venus Climate Orbiter, renamed Akatsuki after launch) is a Japanese Space Agency (JAXA) mission to study the dynamics of the atmosphere of Venus from orbit, particularly the upper atmosphere super-rotation and the three-dimensional motion in the lower part of the atmosphere, using multi-wavelength imaging. It will also measure atmospheric temperatures and look for evidence of volcanic activity and lightning. The scientific payload consists primarily of cameras in the near-infrared range. The Planet-C main bus is a 1.6 m × 1.6 m × 1.25 m box with two solar array paddles, each with an area of 1.4 square meters, on opposite (+y and -y) sides and a 1.6 m high gain antenna on the +x side. On the opposite side (-x) from the antenna is a 0.45 m long orbital maneuvering engine. The total launch mass of the spacecraft will be 640 kg, including 320 kg of propellants and 34 kg of scientific instruments. Propulsion is provided by the 500 N bi-propellant (hydrazine and nitrogen tetroxide) orbital maneuvering engine and 12 mono-propellant (hydrazine) reaction control thrusters, eight with 23 N thrust and four with 3 N. The spacecraft is 3-axis stabilized. Attitude control is achieved using 4 reaction wheels, two with 20 Nms momentum capability and two with 4 Nms, which can be unloaded by the reaction control thrusters. Attitude knowledge is obtained using a gyroscopic inertial reference unit, star trackers, sun sensors, and accelerometers. The solar array panels provide over 1200 W of power in Venus orbit and can rotate about their arms in the y-axis. Power can be used directly or stored in batteries. Communications is via a 20 W X-band (8 GHz) transponder using the 1.6 m high gain dish antenna (for most telemetry data), a pair of medium gain horn antennas mounted on turntables (for housekeeping data downlink when the high gain antenna is not facing Earth), or a pair of low gain antennas (for command uplink). Thermal control is achieved through multilayer insulation, radiators, and heaters designed to keep the inside of the spacecraft below 20 degrees C.
Planet-C was planned to launch on an M-5 rocket with KM-V1 kick stage sometime in 2010 into an Earth phasing orbit with an apogee greater than 200,000 km and was then to be put into a Venus transfer orbit. Due to the end of the M-5 program, it was launched on a H-2A-202 instead. The spacecraft was to go into a near equatorial Venus orbit with an apoapsis of about 60,000 to 80,000 km and a very low periapsis. 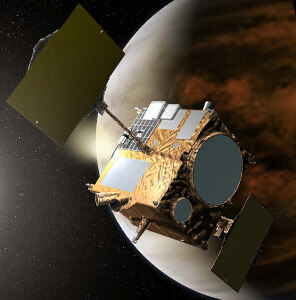 On 7 December 2010, Akatsuki failed to enter orbit around Venus due to a malfunction in the propulsion system. An unexpected pressure drop in the spacecraft's fuel line, or possibly damage to the probe's engine nozzle, are the likely causes. JAXA plans to manoeuvre the probe to try it again five years later. Tests of the engine in September 2011 resulted in low thrust. The back-up option is to use the RCS for orbit insertion. To enable this, the oxidizer needs to be dumped to reduce the weight of the probe. This will result in a less than optimal orbit. On 7 December 2015, another attempt to enter orbit was successful, this time using the RCS thrusters. It entered a 400 km × ~440000 km orbit of ~3° inclination with an orbital period of 13 days and 14 hours.